For those that showed up this morning, thank you all. We hope you gained some insights from us. There was a question about the characters one can or can not use in a password field when installing and configuring Sametime and Cognos. Please keep in mind I do not have the direct quotes from IBM for this but here is what was posted recently in a Skype chat we had. Embed is not working right now, will edit later. A few months back I posted this about a consulting company that called me about a virus on my pc that called them. Now my grandmother, at 91 years old, get this call and she manages to get their number and name from them, and the number works. Quite sure the name is just an alias, as how many people from India are called Steve Johnson I wonder? They claim they are from Windows Technical Department. So naturally I wanted to have some fun and managed to get my IBM Sametime SUT call recorded using a 3rd party tool called SoundTap Streaming. Looks to be free for personal usage just not for commercial business. So anyone else want to have fun, just call and say they left this number with yur sister/mom to call them back, the number is 210-888-9112. The first call (you can listen to it) (the recording may sound like an echo but that goes away) was me calling and asking for Steve. After some brief discussions around which Windows machine and what this was about he led me to the event viewer and claimed all the "errors" were viruses. He would need me to be connected to their Certified Microsoft Support team and would call me back to fix it all. Which they did a few minutes later. The second call (you can listen to it) was to have logmein setup and let them into my pc. At this point I had to say hang on it says you can transfer files when I give you access. And they insisted that I could cut them off at any time and although I suggested they walk me through the process, they would not do it. as you can see from the screenshot, it all is through logmein and looks correct. It was at this point when the person on the line said I should let Jennifer (note their spelling) on by clicking OK and I asked if she was Jennifer and she said no, Jennifer was next to her. After a few tries and my effort to redirect them, they hung up from me. That did not stop them from asking me to click OK as you can see how many times they tried. They ask you to ignore the warning about unsolicited calls, a nice touch they added or just a generic note from logmein, either way, it is impressive how tenacious they can be. Please do yourselves a favor, let your non-IT friends and relatives, especially older ones, realize that just like the dishwasher repair people do not randomly knock on your door or setup service calls, neither does any computer company you have not just called yourself. EDIT: I was told that if they get inside your computer they then deny you access and hold the system ransom for $250 to unlock it again. aside from probably stealing any financial files and leaving code on your pc. 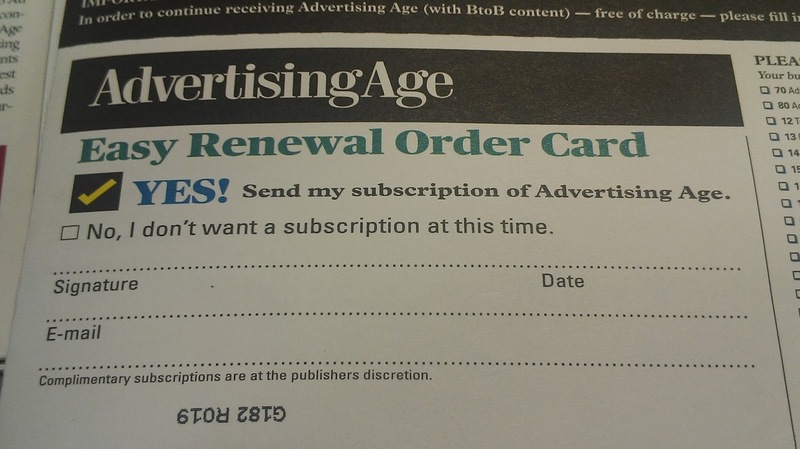 I decided to follow up with AdAge by calling the number shown on the cover to renew my subscription. As previously posted something is very "old school" at Advertising Age or else it is deeper than this. The person on the phone said that my number was a subscriber number but an unverified one. Okay, I asked, how do I verify it since it was moved over from the sister magazine BtoB? She could not tell me. She also could not look me up further to validate any of my information, yet she could see me with my subscriber number. How many other subscribers have called on them to renew and been sent on this run around? Hopefully AdAge is not paying per call for the person answering, they are paying per call as it is an 877 number. The person on the phone suggested that I need to fill in all of the "tell us about your job" bits and my email and sign it and mail back the postcard. See the previous post about my thought on that. So there you have it, one of the leading advertising magazines, not able to advertise for themselves and not able to manage simple CRM or subscription services. However, on the bright side they are keeping the USPS in business and making sure they keep the mail and call centers employed. Hopefully my postcard arrives at the designated place. I wondered about this stuff 2 decades ago, at least i could fax it then. I guess they gave up on faxes, they are all for saving trees. Recently one of the magazines I read, BtoB decided as of Jan 1 to stop printing and is going digital with Advertising Age, a magazine which I read as well. Ok, one less magazine to read. I received my first issue yesterday and it was covered on the outside with a paper cardboard stock reminding me about the change and also including a renewal post card as you can see on the left. Nothing unusual, naturally I should renew and start looking for the URL. Nope. None in site. As you can see from the photo on the right, I need to detach and return the postcard. 1980 called, they have jobs in the mail room. No doubt this was a mistake by some editor or subscriptions house. The problem is it is compounded by including this on the side of the postcard "For faster service, call toll free 1-877....". 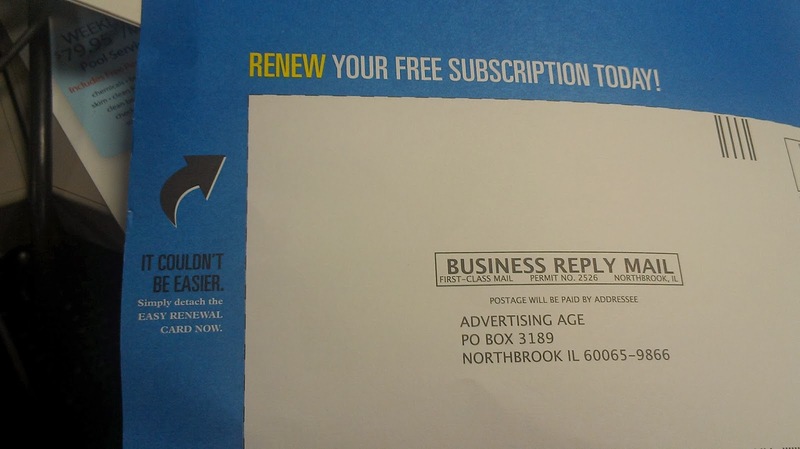 Wow, admittedly that would be faster than the USPS but this makes me wonder what else may be wrong at AdAge. "It couldn't be easier. Simply detach the EASY RENEWAL CARD NOW." Truly not a great way to lead advertisers in this digital age. A sad case of "do as we say not as we do"? At least they asked you to write in your email address. There are so many ways to accomplish the same benefit to the company and encourage renewals yet still use the magazine. First, there is always space available in your own magazine and any space in the magazine could be used, why waste the the cardboard stock for renewals? It is not just the cost but also weighs more, which the USPS workers probably do not appreciate and is more landfill/recycling potential as well. Since there are many different levels of subscriptions, this may not be appropriate per se, however, subscription pricing is not the point of this post. Second, nowhere on the front page of the magazine itself, yes, it is next to the postcard as shown above, is there a URL, not even a (and I hate these myself) QR code to let you know how to find them online. Presume a new reader finds the magazine without the cardboard cover, the URL is not even on every page of the magazine. Note to AdAge, speak to the BtoB team, they got all this right. Third, if you have people's social media details, send them the URL via a tweet or whatever method. Sending via email these days may not get past the spam filter and also people delete emails faster than read them. 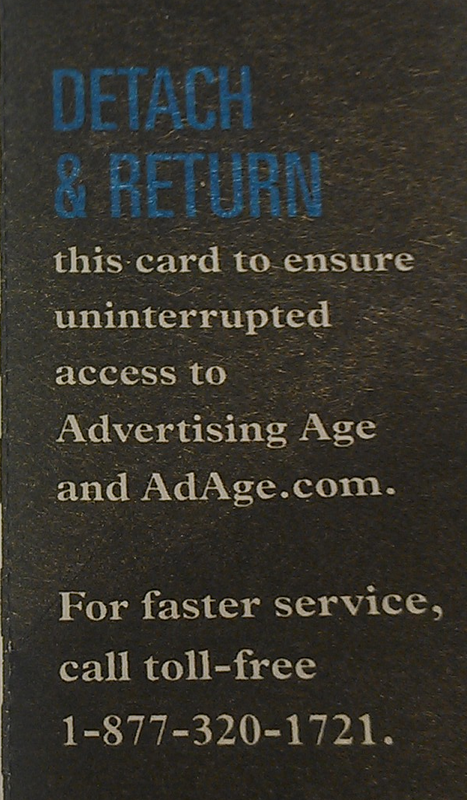 Fourth, presumably, or maybe not, the iPad version of AdAge, would also be an easy way to renew. It has a link but I could not use it, probably because I have not sent in my postcard yet to renew. So the USPS will charge them for all the postcards and mailings. The mail room or service needs to handle all the postcards, presuming none get lost or cut or wet during transit. The subscription database people or scanner has to be fed each postcard individually and get all of your details input correctly if you want to keep receiving the magazine. Do we receive emails that it was received and we are now subscribers? What about our social media efforts and accounts where we want you to let us know about the newest articles? The onus is on the individual because the magazine never thought out this whole process from the start. I still will read AdAge and enjoy it and if you like the world of marketing and advertising you should as well. When working on social and collaboration projects with customers the first thing we want to do is find out what the outcome should be and then fill in the processes and systems to make it all happen so by the time we turn on the accounts or send out something we know how to track and measure everything. It may not be perfect from day one, but it avoids creating busy work for employees that already are very busy. Could you Survive 2 weeks without a SmartPhone? From the looks and messages from people, I would think that it was impossible for some of you to live without your phones. Imagine you had to revert back to a Blackberry Bold or Curve, I used both but more on that in a minute, could you do it? Sure for a day or 2 maybe but 2 weeks? The problem started the day before we left for vacation to Israel, the Thursday of Thanksgiving. I dropped my HTC Vivid Android phone and it landed smack on a rock and shattered the glass. Yeah that sucked, but it was still useful, so I made do on our trip. Either while away or shortly after we returned I ordered a new digitizer off of eBay. When that came in, I proceeded to replace my glass and put it all back together. Powered it on and saw a line cracked and just a shade of red or blue or green and nothing else. Yes, I had damaged the LCD at some step along the way. Back to eBay. Ordered a new LCD which came today. Took it all apart, replaced the LCD and put it back together and happy to say it is good to go again. I learned a lot about how I work and how useful or useless a smartphone is to me. The BB Curve was the slower device I had laying around which is unlocked and I could get all my emails but web browsing was useless and apps were iffy. My friend Paul gave me his old BB Bold which was MUCH faster but still locked down by a BES and so I only had phone service. I decided I would learn to live with my office's iPad but use the BB Bold because at least the browser worked efficiently. I now know that the Bold had a crappy keyboard with the weird left/right slanted keys, but since I rarely used a BB over the years, despite managing numerous BES environments, I figured I could live with this. But now I was a 3 device person, including the laptop. When my phone is working, I rarely need to use the iPad. I prefer typing on my phone over the iPad. The iPad, while an excellent reader device, really is lacking in keyboard intelligence or ease of use. In this day and age of alpha-numeric passwords is it so much to ask apple to let me just hold a key down to get to the alternate key or number? Or to hold it down to get a capital letter? My old Nokia phones always did this and that was in 1999. It is nice to keep so many screens open on an iPad and the battery life is awesome, shame it is such a PITA to type. I could never type this blog post on it without a bluetooth keyboard. But I could go 2-3 days without needing to recharge it. I did not exactly survive 2 weeks without my phone because I had the iPad by proxy. But my postings or photos from the holidays and trips were limiting and that was a shame. The iPad has a lousy still camera option. It could record sound and video but not great quality. I missed the simplicity of opening one of many apps and take photo and post it. I did not miss seeing my email, not one bit. I did miss my contacts and phone numbers but that also was interesting. I had few calls, thanks to the holidays, and did not need to call too many people either. So I went semi-cold turkey on social media and came out of it with an interest to do more and looking forward to this year. For everyone that wondered where I was or why I replied in short or cryptic ways the last 2 weeks, now you know the reason. Yoda always had a way with words. It seems my activities in the last year or so on this blog have been slacking, a sure sign I was busier at work and home. Twitter was down too, I know hard for you to believe. But for those keeping score, my Klout score is still hanging around 62-64, so maybe I was more active than I thought. But I did not write any articles this year that were published, first time in a while. No books written either, although I have some in mind, both technical and fun. I will at least look into having these books published and if there is interest will start writing them. I want to write more articles this year, well even 1 would be more than last year, so will work on this as well. The muse just wasn't very active and I apologize, but as it appears, I have been blogging for 7 years so maybe this was a little sabbatical and now I will ramp back up. Of course, Lotusphere Connect 2014 is coming up and I will post more on this in time. See you in Orlando I hope and since my session is on Sunday at 10:30am no reason not to pop in, that is unless you are on the hog ride that morning. I was notified that 2 of my certifications are ending in the next 90 days. Note: This test will be withdrawn on Nov 30 2013. Sametime lives on and you will be offered the new Sametime 9.0 Admin exams, hopefully by Connect 2014. And according to Deborah Cole and this Connect 2014 webpage we will once again get the benefit of taking free exam tests at Connect 2014. Now unlimited! One of the biggest draws at this event has always been the certification testing and prep labs. IBM is pleased to announce, for the very first time, that unlimited complimentary IBM Collaboration Solutions exams will be available for all registered attendees for the duration of the conference. All other Software Group exams will be available for 50% off the regular price. As in previous years, testing will take place in the Lark room of the Swan Hotel. Since IBM is switching testing vendors in the New Year from Prometric to Pearson Vue, the certification team is asking candidates to create a profile in advance of testing using your existing candidate ID. This can be done at www.pearsonvue.com/ibmThough the physical prep lab will be located in the Peacock room of the Swan Hotel, the Virtual Prep Lab sponsored by Avnet will be available 24/7 for the duration of the conference.